1. Name two causes of bacterial meningitis in newborn infants. 2. How can the incidence of meningitis due to Lancefield group B streptococci be reduced? 3. Name and describe the organism that is the leading cause of bacterial meningitis in adults. 4. Of the different antigenic types of Haemophilus influenzae, which one is most likely to cause invasive disease? 6. 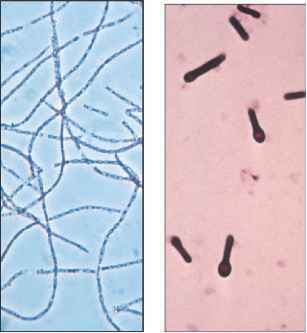 What cell wall component of Neisseria meningitidis is probably responsible for the shock and death that sometimes occur with infections by this bacterium? 7. Describe the Shwartzman phenomenon. 8. What measures can be undertaken to prevent meningococcal meningitis? 9. Why is listeriosis so important to pregnant women even though it usually causes them few symptoms? 10. Give two characteristics of the causative agent of leprosy. 11. Describe the differences between tuberculoid and lepromatous leprosy. 12. How is Hansen's disease transmitted? 13. What is the difference between sporadic encephalitis and epidemic encephalitis? Name one cause of each. 14. What is the least number of different antisera required for treating humans with botulism? 15. Give two ways in which viral meningitis usually differs from bacterial meningitis.